I am planning for the week we get back from break, but boy is my head not in it. I can't wait for some time off. There is still about three feet of snow, but rain today. So melt, snow, melt! Our big plans...water park...trip to Milwaukee to see relatives...and painting and sewing some things for my daughter for her new apartment. That is the goal. I also want to finish some of my TPT items. I am sure I can get something done on our 3 1/2 hour trip to Milwaukee. Thanks to Mrs. Laffin's Laughings and Mrs. Will's Kindergarten for this linky party! We will finish up with a tornado in a bottle demonstration for them to make. For those of you that live in the Midwest...you know that on a given day in fall we can be in our basements or at school huddled in a bathroom due to a tornado warning. We will then review weather that is like a lion and a lamb. Our big idea is how weather can be classified. We will be finishing up our Balance and Motion Unit this next week. First, we will review with a FOSS lesson, rolling wheels and rolling cups. We will finish with a review test that I was going to post, but in my haste to get out the door for spring break I didn't download it. When the kiddos are done they will be doing a quick friction fun activity by testing how their cars are slowed down at different rates by different surfaces. I shared the sheets on a previous post. We will test counters, steel wool, carpet, and sand paper. We will be reviewing the food chain. 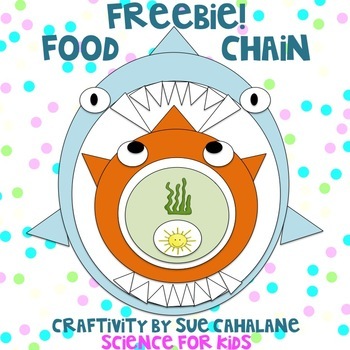 We will focus on last week's vocabulary: food chain, consumer, producer, omnivore, carnivore, herbivore, as well as what a food chain looks like. Students will be getting a sheet that has them matching vocabulary as well as creating food chains from different ecosystems. They will finish up with the art activity that we wanted to do last week. I guess I planned too much. We are working on the earth yet. My kiddos really didn't know how seasons are related to how light and dark it gets in Wisconsin as the year progresses. They couldn't answer questions about day and night, let alone rotation and orbit. So, we will be reviewing in the form of stations. I am using several sheets from the Science Penguin, as well as using the ipads and the app The Day and Night World Map. This app allows students to understand the concept of day and night better using this visual aid. They will also create a model using a lamp and a styrofoam ball. We shall see what they can do. Then a little bitty quiz to check for understanding. Will be working on their Simple Machine Cardboard Arcade Unit. We will share the best invention ever made. We will then use the scenario cards to build a simple machine that will help build our arcade. They will create a mini version of that machine. Happy Spring Break...if you are on break, or I hope your break was what you hoped it would be. I have a to do list that is pretty long. We shall see if I can tackle even some of it.